You can earn a passive income online by writing for revenue sharing content sites. If you love writing about a specific topic or more, you can earn some money fast with your writing, but keep in mind that it will not be much, especially if you are new to the online writing. Revenue sharing sites are content sites that have large bodies of articles published on their sites about a wide variety of topics. Typically, owners of these sites invite writers from all countries to write articles for their sites and in exchange, these sites, as the name suggests, share advertising revenue that has been generated by these articles with the writers. However, how an article earns money depends on the way the site where the article is hosted on operates and the advertising model it supports or uses. Some sites reward the writers by using a payment scheme called PPV (pay-per-view) where these sites offer a flat rate per thousand views of the articles to the writers, irrespective of how much money these articles earn from various ways. But others split the revenue generated from various ad programs and more ways by the articles with the relevant writers, often in favor of the writers. If your articles generate lots of clicks on the PPC ads or get a large amount of traffic to the CPM ads, or perform a combination of both these methods, you will earn more money. Some writers, especially those who do not have their own blogs or websites and who are new or aspiring writers, actually find writing for revenue sharing sites a lucrative way to earn some extra cash fast. On the other hand, others, including both seasoned and new writers, just do not like the idea of writing for these sites for various reasons, especially for very low returns of their time and effort put in. However, although it is true that some writers earn a little passive income every month or even a full-time income writing for revenue sharing sites, they must have worked very hard, written hundreds or even thousands of articles, and promoted their work on the Web. Whether it is to earn a bit extra cash, build a portfolio or earn a passive income on a regular basis, writing for these sites just depends on what their goals are. 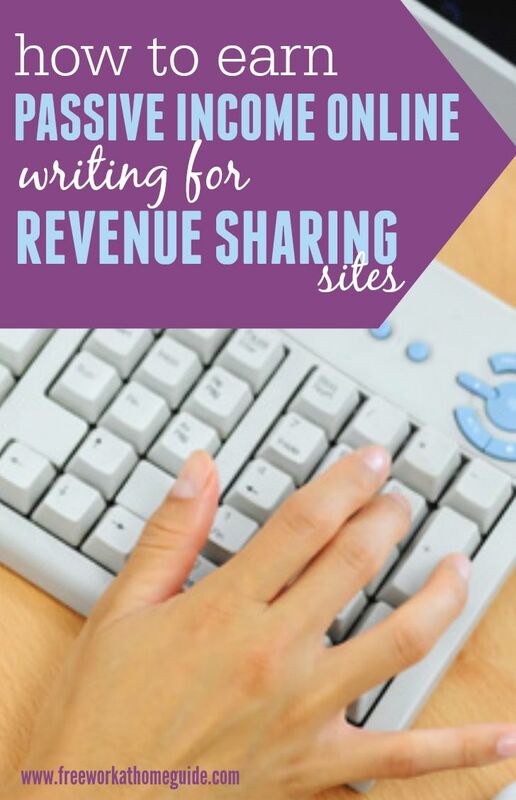 If you are just starting out to build a writing career online, writing for revenue sharing sites is a great way to build a portfolio of your work. You can use your portfolio to showcase your work to your potential clients for securing higher paying writing gigs. You can write about different topics, improve your research skills and learn how to optimize your content for search engines or in other words, how to write SEO content in order to gain more traffic to your content. If you are just starting out, the writing for these content mills is a quick way to earn a little money, even if a tiny amount in the beginning, but the earnings do add up as you earn passive income. You can choose to write daily or once a month or whenever you want to because you are flexible with your posting schedules. If you have a blog or website but you want to write about different or unrelated topics, meaning they are not relevant to your blog or website, then revenue sharing sites are the place to share your knowledge with others. It takes a lot of dedication, time and work to make any substantial money writing for revenue sharing sites. You can earn significantly more by writing for private clients or completing online writing jobs for upfront pay by securing them from online job boards and bidding sites. You will lose all your work if any site you are writing for shuts down from nowhere. If you want a thriving career in freelance writing, then revenue sharing sites are not your best option. If you want to earn more money, work smarter, and want the best return for your time, skills and effort, then you writing for passive income from these sites may not be the right option. You will need to attract traffic in tens of thousands every month to your articles, to earn more, but for most writers it would be difficult to get that amount of traffic every month. You will have to write hundreds of articles to ever earn hundreds of $USDs per month, but you can earn significantly much more than that by writing only a few articles for upfront payments. If you start your own blog or website and make money from your blog posts or articles, you can keep all the earnings to yourself, and have full control over your content. When writing for these content mills, it is important to choose topics that attract a lot of traffic. Write on topics that are popular now. If you are not familiar with these topics, you can research them online and write great articles about them. You will improve your research skills in the process. Do your research first before writing your articles. Choose keywords that are easier to convert into traffic, leads or sales for your articles and build the articles around these keywords. Write great titles with the keywords in them. Use the keywords you are targeting to rank for in search engines throughout the articles but without stuffing the content with them. Use the keywords in the titles, within the first few and the last few sentences of your articles. Use appropriate images for your articles. Optimize the images for the search engines by giving ALT description to the images. If you are using images that are licensed for free use, give copyright credit for them. Contribute regularly by writing at least one new article per week for the first few months to attract more traffic to your articles and build a following. Try to write on various different topics to see what works best for you. It is also a great way to build a niche audience within your targeted audience. Writing for a reputable revenue sharing content mill is an easy way to earn a bit of extra money if you put in some work regularly. If you do the hard work for at least a few months by contributing quality articles to one of these sites or more, you can reap the benefits later, for as long as these sites host your articles and keep the revenue sharing program in place. The more you write the more money you will make, and this is passive income, meaning your earnings do add up. If Enjoyed This Post, Check Out These Too!